← Friday Finds…It’s Eagle Time!! 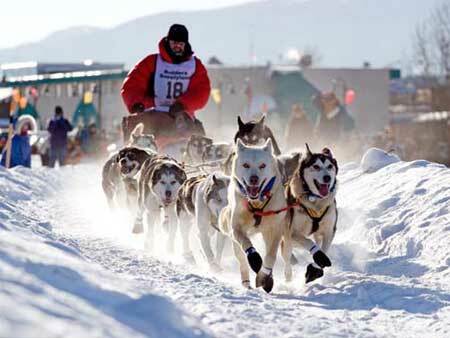 This Saturday, March 2nd, the 41st Iditarod Sled Dog Race will begin. The Iditarod race takes “Mushers” and a team of 16 dogs from to Anchorage to Nome Alaska. This very difficult race takes racers over a thousand miles through blizzards, sub-zero temperatures and strong winds. The race can take over 2 weeks to complete but in 2011 John Baker broke a new record when he finished the race in just 8 days, 19 hours, 46 minutes, and 39 seconds! This year we will be following the race on the Iditarod Website. Each family member has picked a Musher to cheer on. We plan to follow their progress online (we purchased the GPS Insider Tracking Account for $20) and we made a map in our dining room to mark where the Mushers are each day. We are super excited about this years race and are planning a little celebration on Saturday to kick it all off. For the next week in preparation we will be reading the stack of books from the library about the Iditarod. We also plan on checking out some video clips as well. We are looking forward to paying attention to this part of the world for a little while and cheering on our Mushers as we go! Go Ramey Smyth! I am all excited too!